ldv | Carol takes over the world! I’m totally going to get a “Praise Seitan” sticker! Okay, so for breakfast I’m making it a habit of eating Kashi! It sticks with me about three hours and that works for me. 🙂 A lot of the time I have anywhere between 3-6 smallish meals. The reason being is that I have trouble getting all of my calories. I’ve worked out the whole protein thing, which is nice, but yeah. Anyhow, I usually just have some more of the cereal when I’ve had my two bigger meals of the day and still find hunger niggling at me a bit. Strawberry fields rocks me, like, seriously. At any rate, I didn’t really get to eat lunch because I launched straight into making dinner: Seitan. It’s really low in calories and has no fat (at least when it’s homemade from the best I can tell since it’s just vital wheat gluten and water then with spices). Now, if you have a cook book that isn’t La Dolce Vegan, I honestly don’t know. At any rate, the bigger one on the left is turkey flavored and the one on the right is chicken flavored. I used a “fried chicken” recipe to work them up with. 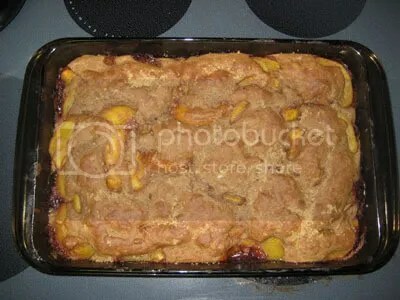 And, to prepare for today, I decided to make the peach cobbler from Vegan with a Vengeance! I think it turned out well, but it did take a fair amount of time. I also suggest using peaches that are riper than the ones I had. The blanching didn’t work as well as I’d hoped but it still wasn’t too bad. It’s just that whole cutting up eight peaches thing. I thought it was neat to make since I’d never made one before. I think, next time I’d just use a little less cinnamon. But it still tasted lovely. I’m really diggin’ this cooking thing! So, I unintentionally ended up making seitan. With the seasoning to be chicken! This came from La Dolce Vegan by Sarah Kramer! Another amazing recipe. She also has a recipe for making your own vital wheat gluten. I suggest doing that because the box of vital wheat gluten doesn’t seem to be very big and it could get very costly… especially when you should have the materials if your food pantry is properly supplied. At any rate, I digress. So, it wasn’t too hard to work the wheat gluten into the consistency you need to have it ready for the next phase. It’s actually got a really interesting feel. It’s kind of like one of those water tubes that you almost drop everytime you squeeze them because they have that oily liquid inside of them. It’s pretty nifty. I’m telling you. If you have a gluten intolerance, you’re missing out… like for real. To cook them, you just simmer the pieces. I wish that Sarah had mentioned something about them getting explodo-huge. I freaked at first when I checked them because they grew to about 10-15 times bigger than they start out at but they start to shrink some as you let some steam out of the covered skillet. They don’t go back to the small cuts you’ve made, but they elongate and thin out (as with my experiences). The concoction of herbs are used to simmer the “chicken” in until it’s cooked down. I think I’ll probably make the last run (which was the fourth ten minute interval of the recommended five or six) about half the normal interval time so that I don’t have them sticking to the skillet. Or perhaps there’s another way, I just don’t know how yet. 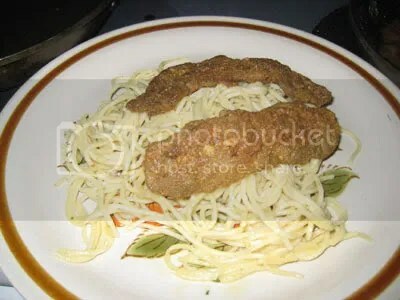 This is the final product with breading that was simmered a bit in olive oil. 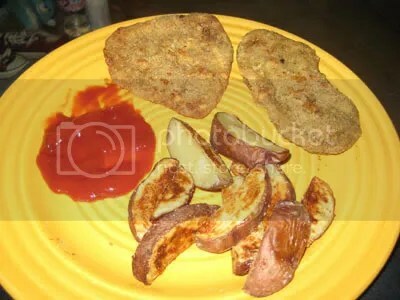 The breading was some wheat pastry flour and blended total flakes. It is a nice, nice set-up man. The noodles, however, are from pasta roni and i will not be buying them anymore. This used to be a common noodle style in my family but this evening it nearly killed me. After changing my diet just three weeks, it seems to have been pretty much it for me. Even as I’m writing this (noting how late it is) , my stomach is still upset with me. But not over the seitan, but the noodles.